Born and raised in San Juan, Puerto Rico, Omar Torres-Kortright has been working as a music promoter in Chicago since 2003 when he founded Agúzate, an organization dedicated to the promotion of independent Latin music in Chicago with an emphasis on Afro-Latin culture. Through Agúzate, Omar has collaborated and co-curated events with the most distinguished music programmers in Chicago, including The Old Town School of Folk Music, Sound Culture, The Chicago Department of Cultural Affairs, and Hothouse. Agúzate’s signature event, The Annual Tribute to the Improvisational Singer inspired a number of subsequent projects, including the documentary “Alive and Kicking: The Story of Chamaco Ramírez”. This last project to be released in 2018 is Omar’s debut as film director and producer. Part of the research related to the documentary is captured in the article “Avísale a Papy Fuentes”, published in the compilation “Cocinando Suave: Ensayos de Salsa en Puerto Rico”, now going on its third edition. For over a decade he served as Manager of Language Services at the Ann & Robert H. Lurie Children’s Hospital of Chicago. This experience was instrumental in his development as an advocate for Latinos and compassionate cross-cultural care for immigrants of all nationalities. Under his leadership, the department doubled in size as he recruited and trained a team of 23 highly-qualified medical interpreters, making it one of the most sophisticated hospital-based language services teams in the nation. 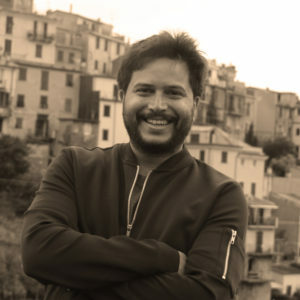 Omar currently serves as Executive Director of the Segundo Ruiz Belvis Cultural Center (SRBCC). Under his leadership SRBCC has received important awards, including the 2017 MacArthur International Connections Grant, the 2017 Chicago Department of Cultural Affairs and Special Events’ CityArts Grant, and the 2017, and 2018 Strengthening Artistic and Cultural Diversity Grant of the Chicago Community Trust. He is responsible for implementing a new advanced Afro-Caribbean Jazz program for teens and curating the highly successful Las Caras Lindas Music Series 2017, a free monthly celebration of Afro-Latin music and culture that brought internationally acclaimed artists from Cuba, Dominican Republic, Puerto Rico and Colombia to the recently renovated Segundo Ruiz Belvis Cultural Center in Chicago’s Northwest Side. More recently, as a member of The Puerto Rican Agenda, Omar Torres-Kortright is one of the leaders in the initiative to bring relief to the people of Puerto Rico from Chicago after Hurricanes Irma and María. The Puerto Rican Agenda has sent two planeloads of supplies to Puerto Rico and delivered critical anti-seizure medication to Hospital Pediátrico Universitario de San Juan. This is the first stage in a long-term plan to reconstruct the island.